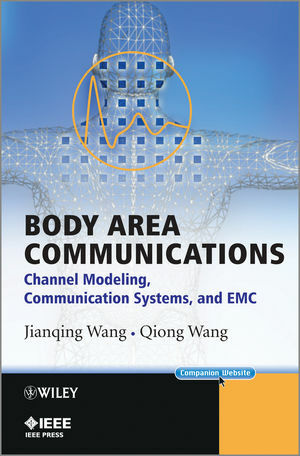 A systematic introduction to body area networks (BAN), this book focuses on three major parts: channel modeling, modulation/demodulation communications performance, and electromagnetic compatibility considerations. The content is logically structured to lead readers from an introductory level through to in-depth and more advanced topics. Jianqing Wang, Department of Computer Science and Engineering, Graduate School of Engineering, Nagoya Institute of Technology, Japan Prof Wang has been working in wireless communications since 1991, and began bio-medical EMC research in 1995. Since 1997, when he became a full professor, he has engaged in body area communications for healthcare, medical, and in-car applications. Prof Wang’s considerable experience in both communication and biology makes him an active member in several body-area-communication-related academic committees, as well as an invited speaker at international conferences. He teaches several related courses to graduate students and has prepared materials for the class lecture. He holds a PhD and Masters in Engineering from Tohuku University, and Bachelors in Engineering from Beijing Institute of Technology. Qiong Wang, Department of Electrical Engineering and Information Technology , Dresden University of Technology, Germany Dr Wang achieved his Phd in Engineering from the University of Nagoya, Japan, in 2010. Whilst studying he worked at the same university as a technical assistant and is now based in Germany at Dresden University of Technology.